When I took toast off my breakfast menu to try the Whole30 Program, I often wished for something chewy and salty. I found a grain-free granola recipe on Nom Nom Paleo that I tried, liked, and have altered since I often substitute ingredients with whatever I can find that's organic. I used mangoes because they're in season and I got a nice supply from a friend's tree. See what you think of my version. Preheat oven to 250 degrees and line 2 cookie sheets with parchment paper. 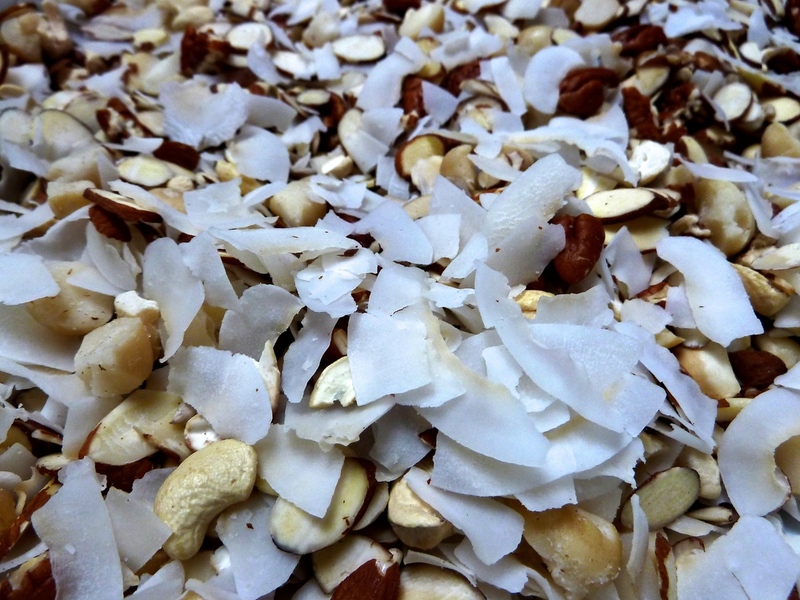 Combine all of the nuts and coconut flakes in a large bowl or roasting pan. In a food processor or high speed blender, combine and liquify the mango, pineapple, orange juice, chopped dates, cinnamon, cloves and coconut oil (melted to a liquid if it's solid). Pour the liquid mango blend over the nuts and coconut flakes and mix well to evenly coat the ingredients. Spread the mixture evenly between both cookie sheets and bake for about 2 hours. Turn the mixture every 15-20 minutes and switch racks once or twice for even baking. Yield: approximately 8 cups. Use organic, raw nuts if possible. If the macadamia nuts are whole, put them in a plastic bag and place the bag on a wooden cutting board and give each nut a gentle whack with a hammer. The nut should split it in two. A quart-size measuring cup holds the mango, pineapple and dates. If fresh mango isn't available, look for frozen cubes or you can substitute it with more pineapple. The mixture's pretty sticky but the low heat and careful mixing should give it an even, baked finish. Watch carefully toward the end of the second hour. Once the granola begins to dry out and bake, browning could happen quickly and unevenly, depending upon your oven. Serving Suggestions: I find that a little (1/2 cup) goes a long way for me. I like to add dried raisins and goji berries before I pour some chilled coconut milk over all of it. I am the self-appointed hunter-gatherer of recipes for the new style of eating that Tall Guy has been prescribed. Food, is the new miracle drug for his auto-immune disorder and for my occasional joint issues. Tall Guy's shopping list must now exclude 23 specific foods and chemicals, dairy, gluten, corn and soy. That's it. We can easily grill some fowl or fish, make a nice big salad (minus onions, mustard greens and cilantro), drizzle some oil and vinegar, sprinkle a little salt and pepper, and call it good. But with all that's available today, we can easily do better than that. a system to hold and organize the recipes. Perhaps helpful for all cooks and diets, here's what I've found so far. The quick-start guide. Sarah Ballantyne, Ph.D, has written a comprehensive book, on the use of diet to manage autoimmune disease. She has a doctorate degree in medical biophysics and personal experience with multiple auto immune ailments. In a video (YouTube 12:38) tour of the book, I could see that all of the graphics and images used would make the immune system a lot more interesting and easier to comprehend. I ordered a hard copy of The Paleo Approach which should be on island before the end of the week. I hear that relying on Google is like online dating, but when I needed an ENT surgeon that specialized in parotid gland tumors, I went with the top search result and we were a perfect match. Also, I know a strikingly attractive couple who met online on their first and second tries and are soon to be married! I love exceptions. Therefore, Google recipe view, Pinterest searches, and Foodily are my starters. If I begin by searching for Paleo recipes, the results will yield those already free of gluten, dairy, sweeteners and legumes and I'll adjust from there. This is a tool that will clip, save, and organize recipes online as well as accept your manual input. You can drag and drop them into a meal planning calendar and it will automatically generate a shopping list. When you're ready to cook, you can either print the recipe or use the Cooking View function for step-by-step instructions using the highlighted ingredients. I'm on Day 6 of a free month's trial of Plan to Eat and so far, can't come up with any reason why I shouldn't sign-up for a year's service. This week I plan to make some granola, a carrot ginger soup, some Paleo mayonnaise, a macadamia nut ricotta and a couple of grain-free crackers. I may even take some photos with cameras other than my iPhone. I may.